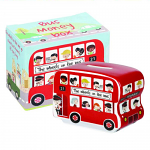 Churchill China have produced this fabulous range of Gifts branded Queens, based on the Classic Children's Song, 'The Wheels on the Bus'. The wheels on the bus go round and round, Round and round, Round and round. The wheels on the bus go round and round, All day long!